The basic premise behind Behavior Tags is simple. You "tag" any of the pages on your site that you want to keep an eye on. Once they've been assigned a tag, you'll be able to better analyze the data Lucky Orange collects, and gain deep insights into where your site is succeeding and where it could potentially be improved. There are two flavors of Behavior Tags: Automatic and Manual. are tags that are automatically assigned to pages with URLs that either contain a predefined term or match a predefined URL. You can make your tagging rules as loose or restrictive as you like. We'll touch more on this shortly. are tags that you manually add to Recordings. Manual Behavior Tags are just "traditional" tags; you simply add keywords separated by commas, and you're all set. Definitions are good to have, but how about we actually dive in, and check out an example. Custom Order — Here customers enter their preferences: cake type, choice of frosting, decorations, etc. Shopping Cart — This is the page the customer is taken to after adding their custom order. You can probably already see that a path is being formed by the pages we want to tag. One might even say we're leaving a trail of breadcrumbs. :-) Okay, so we've decided which pages we want to add some Automatic Behavior Tags to, but how do we do that? To create our tags, we just need to go to Settings » Recordings. 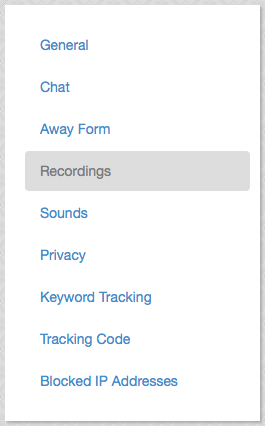 We can also get to our tags by clicking the Behavior Tag Rules button if we're on the Recordings page. Paste the URL into the first text field in the rule editor. Choose whether we want to automatically tag visits made to this exact URL or whether we want to tag visits to any URL containing a fragment of this URL. In our case, we only have a single "order" page. Thus, we only want to apply our tag to a single URL. We can choose the Match URL Exactly option from the drop down menu to tell Lucky Orange to only assign the tag we're creating to our Custom Order page. If the Tag Recording… checkbox is unchecked, we need to be sure to check it before proceeding. We could also check Star Recording to have Lucky Orange automatically star any Recordings of visits to our Custom Order page, but for now, let's just keep truckin'. Now we just have to click the Add Rule button, and we will have created our first Automatic Behavior Tag! Congratulations are in order! So we've created a Behavior Tag. Now what? Well, we have two options. We can create the tags for our other pages, or if we have any existing Recordings, we can retroactively apply our new tag to them (option currently not available). For the sake of "staying in the zone," let's create at least one more tag, then we can come back to retag all of our Recordings at once. If you think you've got the idea, feel free to retag whenever you'd like; it isn't required to create a certain number of tags before retagging your Recordings. So by all means, fly away little bird. Spread your tagging wings, and fly away! If you've chosen to stay in the nest a little while longer, let's continue. The Custom Order tag was a breeze to create because the custom order URL has a one-to-one relationship with the matched URL. What if we want to tag multiple pages with a single rule though? Luckily, it's just as simple. Next up, we have the Shopping Cart page. After an order has been submitted, the Shopping Cart page lists the price of the order and other cart-related details. So why would we set up the Shopping Cart tag any differently than the way we set up the Custom Order tag? Well, if I weren't so forgetful, we totally could (and can). However, I forgot to mention something: our site has multiple Shopping Cart URLs. We have a standard cart for guests, a special cart with online deals for repeat customers, and a cart that's exclusive to organizations requesting catering services and large office orders. Enter cart in the first text field. If it's not already selected, select the Match URLs that contain this text option from the dropdown menu. This time around, let's star any Recordings of Shopping Cart pages so we can easily spot them when we want to analyze behaviors in future. Now we just have to click the Add Rule button, and we've officially created both types of Automatic Behavior Tags! Regardless of how your server's URLs are presented, Lucky Orange can get the term it needs, as long as it's present somewhere in the URL. We've created two new tags, and we've applied them to our existing recordings. Cool. What can we do now? Now comes the fun stuff like conversion funnels, heat maps, and segmented data analysis. Awwww, yeah!